Holmenkollstafetten is the largest relay race in Norway, and takes place mid-May every year. I’ve previously run the entire 18K course on my own, but haven’t had a team to compete for in subsequent years. 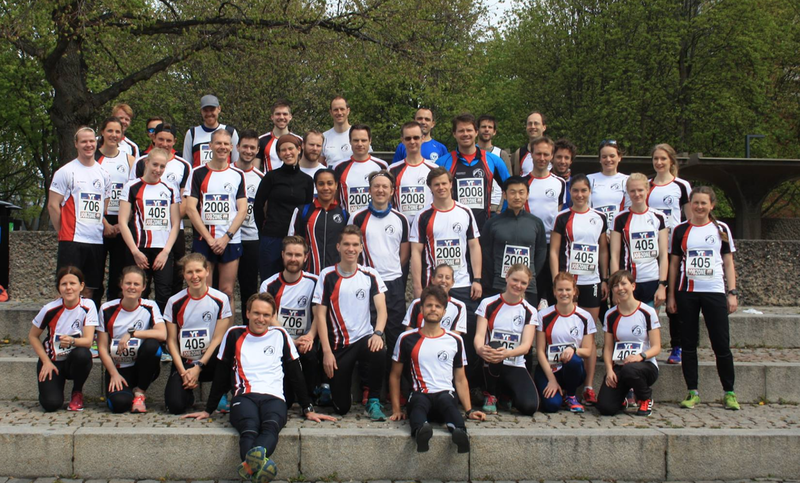 I was gearing up for a long run in the forest, alone again, on the weekend of Holmenkollstafetten until, out of the blue, Oslo’s student track club (OSI) asked if I would run for their women’s team. I said yes, even though I thought me running a relay race for an actual track team was an intimidating prospect. I joined OSI’s practice a couple times before the race. I was reassured to realize I was not way slower than everyone, and that these weren’t stone-faced elite athletes, but friendly people who like to run as much as I do. For the relay, I was given leg 11 of 15, a 1500m leg that passes through iconic Frogner park. I scoped out the leg a couple of days before the race in the pouring rain, and was glad I did. There were some tight turns that at the end that were nice to know about, and the leg ended in an uphill sprint. Holmenkollstafetten goes on all day, with several thousand teams competing. When some friends asked if I could run various legs of teams that were missing an athlete, of course I said yes. After all, how tiring could running only 1500 meters be? (She thought naively) So it was decided that I would run leg 11 for Handelsbanken (a bank) and leg 4, around 2K, for Silicon Labs second team. But giving everything I had on my OSI leg would be the first priority. Team OSI before Holmenkollstafetten! I'm on the far right. I showed up at Frogner park with plenty of time to spare, and warmed up until about 15 minutes before our team was expected to come through. I was really terrified of not being ready for my exchange, so I just hovered around, nervously, watching runners from other categories coming through. I hadn’t seen any women in our category (women’s senior track) exchange, so when I saw Eldbjørg coming in the distance, I thought we must be in first place. I’d better not lose it! I thought. The exchange went smoothly, and I took off. The leg started with a slight uphill, before a gentle downhill where I could really let my legs rip. I felt like I was running so fast, that is until several elite men passed me like I was standing still. I didn’t see any other women though, and I kind of wish I had someone to try and keep up with. 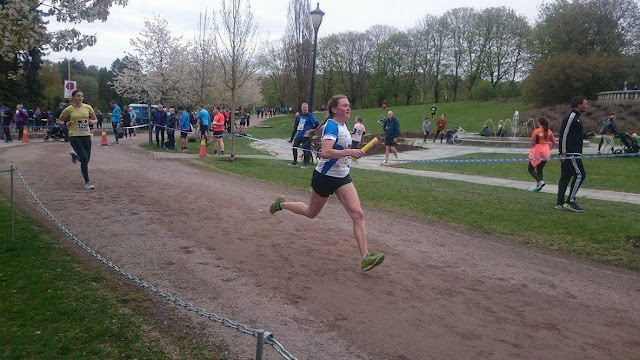 This is actually from the second time I ran the leg through Frogner park, but here I am in action. My whole chest started to hurt and my stomach went numb as I crossed the road out of Frogner Park to complete the final few turns before the sprint to the finish. I was glad I knew where the final turn would be as I sprinted through the maze of streets. The hill to the finish seemed to at least have tripled in size since I last saw it, but I was happy to spot Santoucha, who I would exchange with, waiting on top. I thrust the baton into her hand, gasping for air, my little part in this event now over. This is how I feel about racing 1500 meters. The results later showed that OSI had been in second in our category, not first (I missed the first woman somehow). I held on to our second place, although I unfortunately lost 5 seconds to the chasing third place team. We got caught at the very end of the relay, but managed to keep third place. The exciting part of all of this is that by coming in third place, OSI is now qualified to compete in the women’s elite category next year. And then there were the two other legs. All I can say is I ran them, but that running got slower and progressively more painful with every leg. The later legs were also more chaotic, since more teams were out on the course. I learned my lesson though: 1500 meters a full speed shouldn’t be taken for granted! The upshot of all of this is that I now have a team to train with – OSI. There are lots of fast ladies for me to try and keep up with, and I’ve been enjoying meeting new running buddies at every practice. As someone who mostly runs alone, I think I have a lot to gain by being challenged by others. Besides, I have to run faster at Holmenkollstafetten next year! That last photo almost sent water shooting out my nose! I'm fairly certain the metric mile is the worst distance ever. The only good thing about that distance is that it's over fast!